As mandated by the Department of Education every year, the early registration of students who wish to study in Pasay City North High School – Main Campus has commenced last January 27, 2019 at the school lobby. Incoming Grade 7, Grade 11, Alternative Learning System (ALS), and Open High School (OHS) students have come with their parents to submit the requirements and officially register to be part of the PCNHS-Main family! For incoming Grade 7 students, documentary requirements such as photocopies of school form 9 (SF9) and birth certificate must be submitted to Mrs. Almera M. Alkuino, Head Teacher III and Grade 7 Level Coordinator. Academic Group Head Mrs. Barbara Feliciano, on the other hand, must check first the requirements of Grade 10 completers before registration. Mr. Rene Delizo, Practical Arts Coordinator, and Mr. Asher Aurellano, Senior High School teacher, handled the applicants for OHS while Mrs. Oliva Paranga, ALS teacher, processed the documents of ALS incoming students. The month-long early registration aims to guarantee that all incoming students are registered for School Year 2019-2020 while ensuring that all queries and concerns of parents are answered by proper authorities. It also aims to give out-of-school children the chance to go back to school and give information on Alternative Delivery Modes (ADM) and ALS. #MMShakeDrill is a metro-wide earthquake drill conducted last June 22, 2016 9am onwards in Metro Manila. PCNHS M. dela Cruz campus participated to promote a culture of preparedness for a possible 7.2 magnitude movement of the West Valley Fault. The girl scout of the Philippines and the student council together with the BERT helped in the facilitation of the earthquake drill. A last minute instruction was given to the different student organization before the actual shake drill. Student leaders gave their respective reminders to all teachers and students before the actual drill. Students executed the “duck, cover and hold” during the actual drill. Students simulated the actual evacuation during the dill, Mr.Asher Aurellano helped in facilitation of the actual evacuation. Members of the BERT made sure that the gates are open and clear of danger just before the actual evacuation. The actual mobilization of the students going to their respective evacuation area that was assisted by the faculty. Students just arrived in their respective evacuation areas. Faculty members assisted in the head count of students during the arrival of the students in their respective evacuation area. Dr. Renato Mesada facilitated the evacuation of the students and at the same time gave the students some reminders on the importance of disaster preparedness. Student leaders and faculty members assisted the students in returning to their respective classrooms after the shake drill. Some faculty members together with Brgy chairman Dante Dimaculangan and the other brgy. Officials during the Shake Drill. Post conference after the shake drill and photo ops together with the different student organization that helped in the recently concluded shake drill. http://pcnhsmdelacruz.depedpasay.ph/ is the official website of Pasay City North High School – M. dela Cruz Campus providing school’s information – Programs and Accomplishments, News and Events, Contact Information and data on linkage of the school to DepEd Pasay which are necessary for transparency as a government institution. This website also features school’s activities and achievements. The official school website will be the homepage of Google web browsers in accessing the internet in all offices of Pasay City North High School – M. dela Cruz Campus. Reading Proficiency is one of the fundamental aspects in learning not only in the absorption of knowledge and the acquisition information but also in the attainment of personal and social growth of learners to propel them to gain clearer insights in life and eventually be transformed to become productive individuals. In line with this idea, the school, while implementing the different DepEds Reading Program has exerted its effort to extend the appropriate help to the diagnosed students with reading difficulties likewise to enhance the reading skills of those who belong to the cream of the crop. 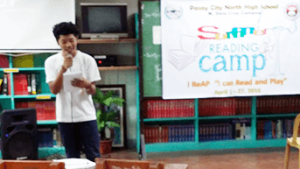 Thus, the administration of the 2016 Summer Reading Camp would ensure the school’s objective to further promote the love for reading among the students and their family as well. In compliance with the unnumbered Division Memorandum dated March 23, 2016, regarding the conduct of the 2016 Summer Reading Camp Across all Learning Areas, the Department Heads and Year Level Coordinators headed by the School Principal Scheduled a meeting to plan the activity. Concerned teachers then, were advised to identify and list down the names of target participants. Letters were sent to the parents. Tarpaulin was posted at the gate and the Supreme Student Council aside from the facilitators were mobilized to encourage the campers. The Kick – Off Activity was highlighted with a parade of the participants at 8:00 A.M shortly before the opening program. School Administrators, Department Heads/ OIC’s, teacher facilitators and students joined. The school banner, tarpaulin and megaphone were used by the paraders. The Opening program started at 9:00 A.M held at the school’s Audio Visual Room. The presence of the Monitoring Team from the Division of Pasay headed by Mrs. Leuvina D. Erni and Mrs. Normina Hadjiyunmos made the event more significant. Following the Division Memorandum, the campers were composed of sixty students who were grouped into two. The first thirty (30) the Able Readers – attended the Enhancement class, and the remaining thirty (30), the Struggling Readers, attended the Intervention Class. Play– based daily activities were provided to the learners by their teacher facilitators to ensure that the students would not be bored during the whole day of classes. To monitor the attendance, the teachers used the Daily Time Record (DTR) whereas the students used Daily Attendance Sheets where they print their names daily and affix their signature. Based on records, students daily average attendance was 22, 17 the lowest number of attendees while the kick – off and culminating activities got the highest number of participants. Both teachers and students complied the forty (40) hours required attendance. There were six teachers/ facilitators in five learning areas – English, Science, Math, Filipino and Araling Panlipunan who were designated by their respective department heads. Some of them volunteered to join the campers instead of enjoying early summer break. They planned, discussed and agreed on the activities to perform suited to the level of each group of campers. Selected students from the Enhancement Class were utilized by the facilitators to join the Intervention Class to lead the daily fun – filled activities. All participants observed division of labor all throughout the camping period. 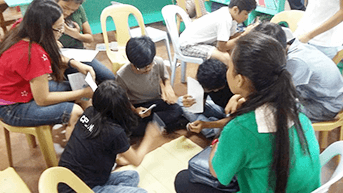 The facilitators/ teachers made variety of instructional materials based on the needs of the learners/ campers. These are audio visual materials and we did employ the amazing race as their final assessment. The school provided everything to make the Summer Camp successful. Aside from the food for all the campers from the first to the last day, instructional materials were also availed. Outside the classroom setting was not materialize due to the construction of additional building, instead the school library, Audio Visual Room and Gymnasium were utilized by the summer campers. Office of the Ombudsman awards Leaders for Integrity, Victory and Education (LIVE) for it’s meritorious achievement in the Campus Integrity Crusaders (CIC) Best School Project during the 2nd CIC Congress at Philippine Science High School, February 15, 2016. In call of Ombudsman Conchita Carpio-Morales to spread her office’s advocacy and revive the virtue of integrity, LIVE, the official body of Pasay City North High School-Main to CIC , launched the project ‘Like My Idol’. ‘Like My Idol’ is a new activity decided by the officers of CIC–LIVE to implement. This is unique in the sense that this will bring closer to students – social media. Specifically, Facebook. The officers usually post five personalities in the fan page of CIC–LIVE and underpinned are little information about them. In essence, it is very simple by liking only the personality that the students’ preference. The most like will be declared idol of the week. Hence, the activities simplicity will ensure and provide students’ inspiration and interest about the life of famous individuals whom they already know and don’t know. At the same time a little knowledge will gained regarding the life of the famous individuals who changed the world and society. Fortunately, the committee chose this project as the Best among all CIC- Projects implemented in schools in National Capital Region (NCR). According to Efraim Fernando, School CIC adviser, this award will be a living testimony in the commitment of LIVE to always cooperate with Office of the Ombudsman in raising the virtue of honesty and good governance. Moreover the CIC President, Justine Jann Reyes, said that it’s a great privilege to be awarded of this kind of precious recognition and he will continually be a good and candid leader in the future as he learned a lot implementing ‘Like My Idol’. Regine Baranda, Grade ICT student, wins first place the Webpage Designing during Division Technolympics held at AMA- Makati Campus, January 13, 2016. With the supervision of Mark Anthony Felix, Baranda, with her sharp memory, has able to sweep all other contenders of the webpage designing contest from all over Pasay. Baranda undergo an intense training- memorizing long codes which will be the design of the page, before the contest manifesting her great hunger to win the contest. According to an interview before the competition, Baranda said that she is very determined to win the contest and to bring pride the school. Election 2016 has been the chosen theme of the page to be designed. So with Baranda’s invaluable technological skills, she was able to convey the enthusiasm of the country in search of transformational leaders for four hours allotted time. After the actual contest, the contestants should explain their works on how they came up with those designs. With Baranda’s witty and confident explanations, she impressed the judges. At last, Baranda unexpectedly wins and represents the division in the contest’s regional category. On the other hand, Web designing encompasses many different skills and disciplines in the production and maintenance of websites. The different areas of web design include web graphic design;interface design; authoring, including standardized code and proprietary software; and user experience design. Telstra Foundation Philippines held TELSTRA-Teletech Bayanihan Caravan 2015 last October 22- 23 , 20015 in PCNHS – Main School Grounds. They started the program by announcing their activities that would nurture every learner and encourage them to join the workshop. They distributed food and drinks, which is part of their program. They also introduced activities to the students for them to enhance their different skills. Those are the Adobe Photoshop basics, Denim bag and wallet making, upcycled bag and wallet making, Basketball Clinic, Volleyball Clinic, Physical Fitness (Zumba), Do-it-yourself Sandals, Voice lessons, Dancing lessons, Theatre Arts, Polvoron and Pastillas making, Christmas Decor Making, Fun Board Games, and Urban Gardening. They will come back here on November 07, 2015, Saturday, for their workshop activities that will enhance our skills in different kinds. The said activities are part of their jobs as successful and concerned employees of their company who are there for us to help and guide us in shaping our future. Renato Mesada, Pasay City North High School’s new principal, hailed the teachers with his lovely intermission number during World Teacher’s Day. He sang the song Never Surrender by Cory Hart. “To all students, thank your teachers as they do their best to teach you in different learning areas. And to all teachers, never give up to teach our future heroes and love them as your own children,”Mesada said. Hail PCNHS Teachers! Mesada surprisingly had an intermission number. 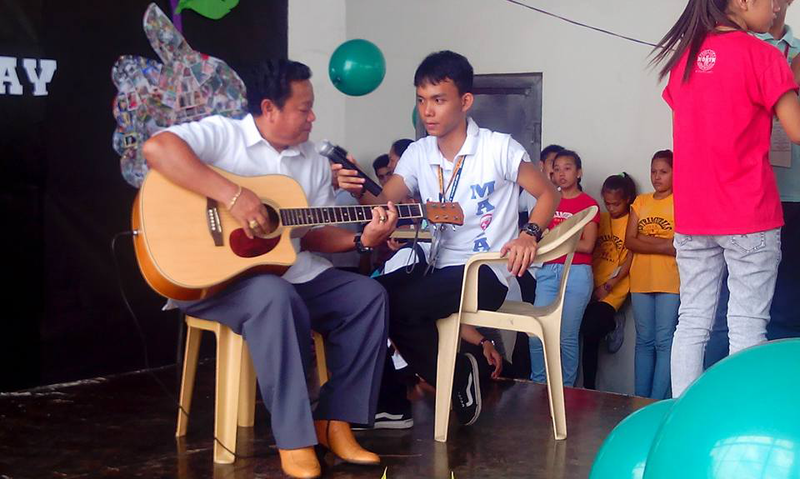 He sang “Never Surrender” with his guitar which commemorates the hard works of teachers at PCNHS Gymnasium. His intermission number will be reminiscence to the PCNHS as he is the first principal who performs in front of students. Northenian’s Reaction As the new Principal, PCNHS students were surprised because of intermission number prepared by mesada. “I was uninformed that Mr. Mesada can sing. He is so talented, he can sing and play a guitar,” said by Janeth Ferrer of Grade 10 – Rizal. His performance is dedicated to the teachers for their hard works and bestowal to the students. Science Department of Pasay city North High School conducted the following activities on Sept. 14 to celebrate the Science Week 2015. Day two; Sept. 15, the Poster and Slogan Making Contest which is held at the library and managed by Mrs. Gargar and Mrs. Sison. Moreover, the winners are; Magadia, Ramilito – 1st Place, Galicia, Karl John – 2nd Place, and Candido, Wesley – 3rd Place. Day three; Sept. 16, the Film Showing of Black Hat that is also held at the library and take in – charge by the Science Teachers. Day four; Sept. 17, the Quiz Bee which is held at Grade 10 – Rizal`s classroom and managed by Mr. Parreño. Furthermore, the winners are; Cabigas, Mark Anthony – 1st Place and Belgado, Jade – 2nd Place. Day five; Sept. 18, the Sci – A – Rap, Sci – Awit and Ecorampa. Which is held at the Gym and managed by Mr. Jr. Bacuitis. Supreme Students Government (SSG) prepared a successful surprise for the World Teacher`s Day, October 6. The SSG, headed by Mr. Efraim Fernando thought of creating different surprises in their rooms for every grade level. They also prepared a program which was enjoyed by every teacher. Kenedy Perez and Regine Baranda hosted the different preparations for their teachers to enjoy such as a game performs by students different booths. The program ended successfully with teachers having smile on their faces.